RCH Rod Locks - Underwater Oilfield Trees | Advanced Machine & Engineering Co.
Argus Subsea produces its AZ-10 fully concentric, vertical mono-bore subsea tree design for rapid field development. Originally designed for low net present value (NPV), marginal and smaller fields, where the capital investment containment is critical and the need exists for off-the-shelf hardware, the AZ-10 can be run on any rig, regardless of moonpool size or accessibility through a V-door or port side. Essentially, according to Earl Broussard, the company’s director of sales & marketing, “Anywhere a rig can power a BOP, the AZ-10 can operate effectively. And, being a standard horizontal tree design with a universal tubing hanger system that runs in any 18-3/4”, 10,000, or 15,000 psi wellhead, with a concentric design for all downhole and tubing hanger-to-tree interface, it can be quickly put into service.” In fact, the company’s literature boasts a typical reduction in time to first oil of fifteen months, with lower CAPEX and OPEX costs, less drilling, and wellhead completion cost, plus reduced third-party cost. The AZ-10 is currently rated at 10,000 psi working pressure and 6000’ water depth and is designed to the standards of API 17D, API 6A, PR2, NACE MR0175, and AV1 PR-2 USV. The unit weighs approximately 50,000 pounds and is light enough to be handled safely with rig cranes and easily transported to the moonpool. The AZ-10 can be deployed through any Generation-2 semi-submersible or newer generation rig’s moon pool. 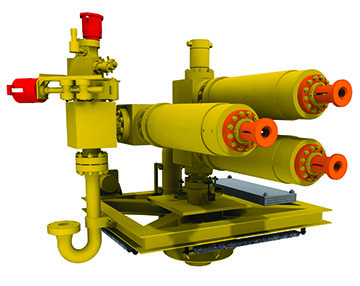 A much simpler design than most horizontal or vertical trees, the AZ-10 requires only five running tools versus 20-30 typically found on comparable subsea tree systems. The units are designed for 20 years of service life in production, injection, or well test operations. The hanger system operates on a lock and seal system that uses mechanical and hydraulic sealing within the tubing hanger. A key component designed into the AZ-10 is the AMLOK® hydraulic rod lock, provided by Advanced Machine & Engineering (AME) of Rockford, Illinois, a designer and builder of various rod locks for both hydraulic and pneumatic holding, in the event of a power loss. AME rod locks are typically found on all types of off-highway and construction equipment, as well as materials handling devices, machine tools, and elsewhere; used to secure a cylinder rod in place to prevent further motion. AMLOK® rod lock highlighted on tree. Each rod lock operates to 3000 psi and provides 50,000 pounds of axial holding force at depths of 5000-6000’. Special construction, porting, and heat treatment were utilized in the manufacture of these devices. For the application on the Argus Subsea trees, according to Shane Hatfield, AME sales manager, several challenges were apparent and a few were not. The obvious obstacles were the depth and the pressures involved. The maximum load was to be 3000 psi and the axial holding force approximately 50,000 pounds at typical depths in the 5000-6000’ range. To address these issues, AME engineered the rod locks from 4140 steel with electroless nickel plating and a specially formulated two-part epoxy to create a completely sealed unit. Marine grade lubricant was used. “Those were the easy parts,” muses Hatfield. With the external sealing system of the AZ-10 and the wide variety of connections involved, the construction of the rod lock also needed to accommodate the unique challenges of force over distance in a wide window of installation conditions. Since the customer was very cost-sensitive, it was necessary for AME engineers to create a one-size-works-for-all unit and this presented considerable application engineering challenges. “This was the hard part,” recalls Hatfield. As the attached diagrams demonstrate, AME rod locks are actuated by a spring/collet mechanism upon loss of hydraulic power and unclamped by the restored pressure. They are built to accomplish a mechanical locking, holding a cylinder rod or machine shaft in position, up to the rated load until power is restored and the locking mechanism is released. Working with Chance Burton, the driving force behind the original engineering effort at Azura, the predecessor company to Argus, Hatfield and his team demonstrated AMLOK® rod locks as the only design that worked immediately over the entire range of performance scenarios. 1500 psi release and 3000 psi compressive were needed to satisfy all conditions and the AME engineers successfully satisfied these criteria. Key factors in the success of the AMLOK® design here are the special porting and autoclave treatment used. After an initial order of 10 units (2-4 used per tree), the business has remained steady, according to Hatfield. 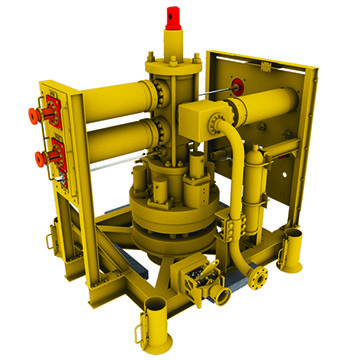 These rod locks have been used successfully on numerous installations of the AZ-10, where the connections to numerous wellhead equipment brands have varied considerably.